According to the Canada Revenue Agency (CRA), 28 million people file income tax returns each year and of that number, 50% use tax preparers. Tax preparers can register with the CRA to use EFILE to transmit the completed return through an encryption technology that instantly acknowledges the tax return has been received. • prevent the taxpayer from understanding how the refund amount was calculated. Information about the taxpayer is easy to obtain. Most taxpayers are asked for their last year’s tax return, which contains all the information required for the current filing. The taxpayer may also be asked for their account number, personal identification numbers and answers to security questions to make it easier for the tax preparer to access and manage a personal tax account. Electronic filing has many benefits. On the positive side, it is faster and “paperless.” Unfortunately, the negative side means that it is easier for unscrupulous tax preparers to defraud the CRA. 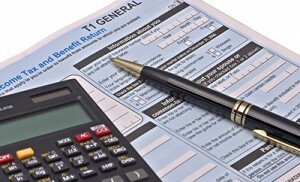 As long as the tax return is accepted electronically, the CRA will likely issue a computer-produced refund to the taxpayer. It is only later, after the system has set up audit thresholds and starts requesting information from the taxpayer, that the fraud may be revealed. 1. higher expenses or lower revenue for sole proprietors who also receive T4 income. A loss from self-employment is applied against the T4 income to produce a reduction of taxable income and thus a refund of T4 income tax remitted by the employer. If the client is also a GST/HST registrant, the tax preparer may be able to obtain a refund in this area as well. 8. rental payments or property taxes in excess of the actual amounts. If the CRA refund is deposited into the tax preparer’s bank account, the preparer quickly removes it and disappears to parts unknown. If the refund is not deposited to the tax preparer’s account, the tax preparer may simply base their fee on a percentage of the falsified refundable amount. The taxpayer, elated by the high refund, gladly pays the exorbitant fee unaware of repercussions from the CRA when the fraud is revealed. The taxpayer, not the tax preparer, is responsible for the accuracy of the information filed. The taxpayer may mistakenly believe the tax preparer is ultimately responsible for the fraudulent tax return. This is not true. The CRA takes the position that the taxpayer is responsible for the accuracy of the personal tax return. On the signature page, just above the taxpayer’s signature line the words: “I certify that the information given on this return and in any documents attached is correct, complete, and fully discloses all my income” provides a reminder of the taxpayer’s responsibility. Certainly, the taxpayer may have recourse against tax preparers who file fraudulent returns. Realistically, however, it may be impossible for the taxpayer to locate the fraudster and even then, the legal cost and time involved to sue may not be worth the expense. Unfortunately for the taxpayer, the CRA may be tardy in requesting information from the taxpayer about reassessed years. Thus, if fraudulent filing has occurred over more than one tax year, the sudden emergency of having to respond to a reassessment covering several years will come as a shock to the taxpayer. • Costs will be incurred to review the reassessments and address issues raised by the CRA. • The new tax preparer will undoubtedly have to process a new tax return using the proper information in order to compare it to the fraudulent submission. • The taxpayer will have to pay the taxes on the amended amounts and will have to repay the amounts refunded by the CRA based upon the falsified returns. • Penalties and interest may be assessed. • Talk to your friends. They may be among the 50% of individuals who use a tax preparer. Find out how long they have used the service and whether there have been any major reassessments. • Talk to people in business. Most use the same qualified professional to prepare their corporate and personal tax returns. • Ask the tax preparer for credentials. CPAs are registered with the various provincial institutes and should be able to provide a licence or membership number. Don’t hesitate to contact the various provincial institutes to determine whether an individual is in good standing. • Your tax preparer should be available year round. You want a firm or individual with a locally established presence. Online businesses allow data to be processed anywhere in the world. But, as a taxpayer, you should consider whether you want a virtual relationship in the Internet hinterland or a flesh-and-blood relationship with someone in your community with whom you can meet one-on-one to discuss tax issues. • Ensure that you receive a complete and unabridged copy of your tax return, whether the return is hard copy or PDF. • Review the tax return for reasonableness before you sign the T183, “Information Return for Electronic Filing of An Individual’s Income Tax and Benefit Return” that allows the tax preparer to EFILE your return. If you have qualms about the tax return, do not sign and ask for all data to be returned. • If you are still uneasy about the tax preparer, but your return appears reasonable, request the tax preparer to EFILE the return while you wait for confirmation the CRA has received it. • Do not provide permission for the funds to be deposited directly into the tax preparer’s account. Carefully read Part C of form T183. • Always obtain a copy of your signed T183 form if you have doubts about the integrity of the tax preparer. The signed form will not prevent the individual from changing the form before transmitting the tax return but it will provide evidence the tax preparer misappropriated your funds. Whether you are going to a tax preparer for the first time or switching to another, carefully vet the tax preparer’s qualifications. Tax time is stressful enough without the added risk of future problems with the CRA. Establishing a long-term relationship with a trusted tax preparer allows them to understand the changes taking place in your life and determine whether tax treatments are available to minimize the taxes payable while at the same time satisfying the requirements of the CRA.